King Philip, 1 @ Stoughton, 3 – Final – King Philip picked up a big win in the third set but Stoughton bounced back to win the fourth set, and the match (25-20, 25-15, 10-25, 25-20) against the Warriors. Mia Bennett led the Stoughton defense with 25 digs while Molly Turner and Hanna Holden combined for 32 assists, 22 kills and seven aces. For King Philip, Catherine Waldeck had nine kills and two blocks, Kat Kmetz added six kills, three aces, and 10 service points, Shayla Weitzman chipped in with a pair of kills, seven aces, eight digs, and 15 service points, and Kristen Masse finished with five kills and an ace. North Attleboro, 39 @ Sharon, 22 – Final – Sharon and North Attleboro split the top four spots but the Eagles had the next six runners to earn a win over the Rocketeers. Alex Starovoytov took first overall for Sharon while Jacob Dubin was third overall. North Attleboro’s Liam Monahan was second and Julian Dixon crossed over fourth. Top 10: 1. Alex Starovoytov (Sha, 15:19) 2. Liam Monahan (NA, 15:45) 3. Jacob Dubin (Sha, 15:59) 4. Julian Dixon (NA, 16:06) 5. Jared Osofsky (Sha, 16:13) 6. James Kong (Sha, 16:14) 7. Jordan Saks (Sha, 16:16) 8. Mark Starovoytov (Sha, 16:18) 9. Kanishka Sethi (Sha, 16:22) 10. Bradley Weiss (Sha, 16:23). Stoughton @ Canton – Postponed to Thursday, 9/27. Franklin @ Mansfield – Postponed to Thursday, 9/27. Taunton @ King Philip – Postponed to Wednesday, 9/26. North Attleboro, 22 @ Sharon, 33 – Final – North Attleboro took first, second, and third in the race to earn a win on the road over Sharon. North’s Olivia Forbes, Stephanie Hawkins, and Cate Hanewich were the top three runners to pace the Rocketeers to a victory. Sharon’s Eliana Boxerman was the top Eagle, taking fourth overall. Top 10: Olivia Forbes (NA, 19:04) 2. Stephanie Hawkins (NA, 19:18) 3. Cate Hanewich (NA, 19:33) 4. Eliana Boxerman (Sha, 19:41) 5. Daphne Theiler (Sha, 19:42) 6. Juliana Dudziak (Sha, 19:58) 7. Emily Manning (NA, 20:34) 8. Catherine Griffin (Sha, 20:41) 9. Shruti Srinivasan (NA, 20:47) 10. Margaret Li (Sha, 21:03). 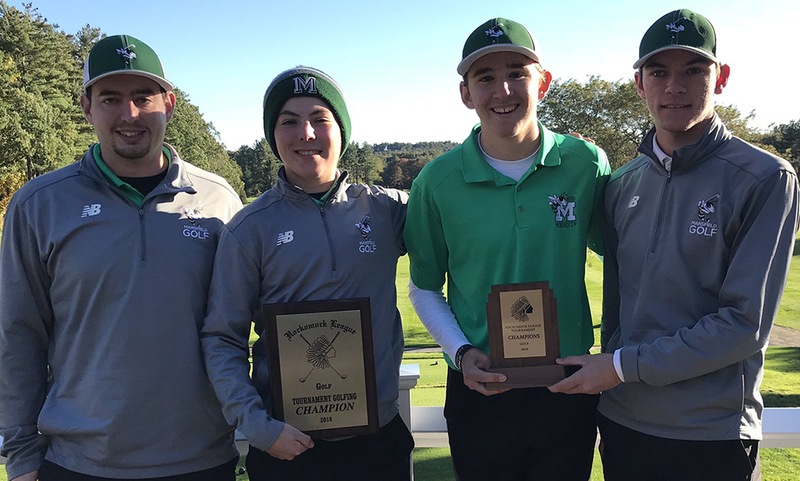 Oliver Ames, 173 @ Franklin, 172 – Final – Franklin senior captain Matt D’Errico earned medalist honors, leading the Panthers to a one-stroke win over visiting Oliver Ames. D’Errico carded a low-round of 40 while captain Jack Paterson shot a 42. Olvier Ames’ Thomas Walsh and Nolan Donze each shot a 43. Attleboro @ Mansfield – Postponed to Wednesday, 10/3. Foxboro @ Taunton – Postponed to time and date TBD. Milford @ Canton – Postponed to Thursday, 10/16. North Attleboro @ Sharon – Postponed to Friday, 9/28.